Threading a Singer Genie bobbin is simple and takes less than a minute. In fact, threading the sewing machine bobbin might be the fastest and easiest step before starting a sewing project. All you need for this project is a bobbin already wound with thread. Turn off the machine. 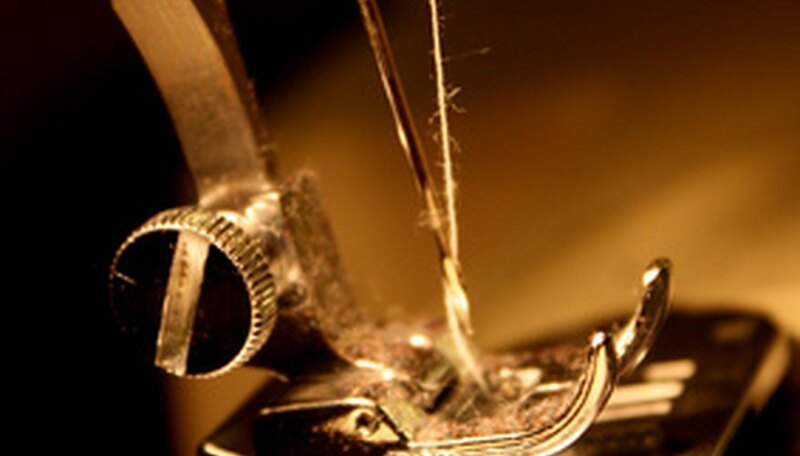 This may seem obvious, but it's always a safe idea to make sure the machine is off before working under the needle. Raise the needle and presser foot to their highest position. This allows more room to work in the bobbin case below. Open the bobbin case beneath the needle and presser foot. This is a sliding, metal cover at the base of the machine; simply slide it open. Remove any existing bobbin from the case. Drop in the new bobbin you'd like to use. Make sure the thread will unwind to the right in a counter-clockwise rotation. Pull an inch or two of thread to the right to prepare for threading. Pull the thread down toward you, making sure it catches under the tension spring. It should now run through a slot in the bobbin holder. Guide the thread up and to the right in a diagonal line over the bobbin. Pull the thread another inch or two to make sure the thread runs smoothly. Hold the end of the thread while closing the metal cover. There's a small slot in the cover near the needle plate, place the thread in that slot. How Does a Bubble Gum Machine Work?